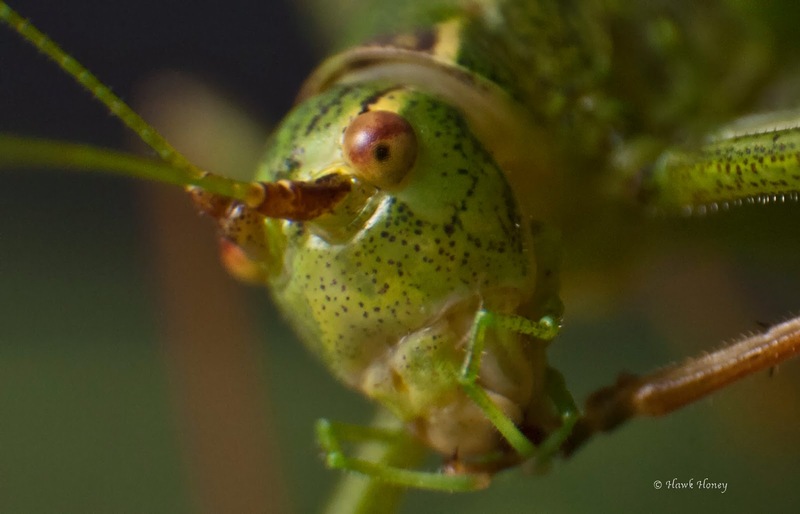 Suffolk Naturalist: An invasion of friendly forces are heading this way. An invasion of friendly forces are heading this way. Hello everyone, good to blog to you again. Well, dare I say it, I think that autumn may finally be here. How did I come to this random conclusion? I've noticed the leaves on trees changing colour of late, not always a sign of autumn, but a good pointer. The leaves on my 'mile a minute' creeper in the garden also went a deep lovely red, followed by a mass exodus to the ground (someones gotta clear it up and I don't think the cat will be doing it). But my last piece of compelling evidence must be the arrival of the beautiful coloured Fieldfare (Turdis pilaris) and the even more beautiful Waxwing (Bombycilla garulus). These birds usually make the UK a winter retreat when food supplies in Northern Europe begin to dwindle and the first sightings of Waxwings are starting to come in from the Shetland & Orkney isles. It won't be long before they start making their way down the east coast and more inland in the search of berries, especially Rowan berries, and fallen fruits. Now, if you don't have any fruit or berry trees in your garden, there might another way of attracting these lovely birds closer to home. I'm trying out my new Waxwing/Fieldfare feeder that I knocked up over the weekend for the measly sum of £2. Firstly, go to your local hardware store and buy a piece dowelling like the one above. Not too thick otherwise you won't get your apples on it. Then, using a drill, or find someone who knows how to use a drill, drill 4 alternating holes through it so it looks like the picture above. Again, don't make the holes to big otherwise your dowelling might snap. Drilling a hole in the dowelling. Be careful with electric tools please. Next, you want 2 nice apples, buy English if you can. Cut each one in half cross-ways, and core like below. Find a nail, stick, or something that you can place in the bottom hole and thread your first half a apple on to your dowelling, skin side down. Make sure the apple sits firmly on you nail/stick and then repeat the process as you move up the stick until all drilled holes now support half a apple. Then place the bottom end firmly into the ground. You might need to tie a couple of canes to it to give it some support. Waxwings, your food awaits you! There you have it, a Waxwing feeder for a couple of quid. Now all we need to find out is if it works, so watch this space. Alternatively, if you fancy trying the same thing out, let me know how you got on. I don't know about you, but we have a tumble dryer, and tumble dryers have lint filters, a fine mesh that catches the lint blown off your laundry in the drying process. Now I've always thought, as I clean the filter out from time to time, that surely this lint can be put to good use instead of going in the bin? But clothing is so cheap nowadays, no-ones going to start recycling it into clothes again, are they. So what other uses could it be used for instead of landfill? looking at its lovely softness and the way it mats together, I reckon this would make great nesting material for birds. So, instead of throwing all my lint in the bin, I've decided to start collecting it ready for next spring, then using a cheap wire whisk, I can hang it up in the garden for the birds to take what they need for nest building. That's the plan anyway, will let you know if it works next year. My last blog was a small plea for a moment of your time, just to send an email to Suffolk County Council in support of a green lane in Mellis, Suffolk that is under threat from 4x4's and off-roading motorbikes. I would like to thank all of those who sent emails, including Steve Hallam (thanks Steve). I got an email back from the person concerned with the situation to say that my concerns were being taken seriously and would be passed on to all those involved in the decision making process. So please, if you haven't sent an email yet, please do so now. Each one is read and considered and you can read about the situation here. Emails need to be submitted by Nov 2nd, so no time like the present to get yours sent off. Yes, the other day, whilst doing my general cleaning duties. 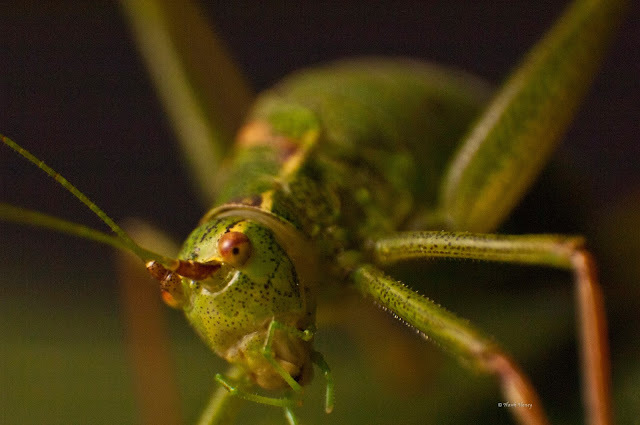 I came across a Speckled Bush-cricket (Leptophyes punctatissima) sitting on my front door. I thought nothing of it except to put it in a pot and get some photos of it, which it greatly obliged me. Speckled Bush-cricket cleaning his tarsi (feet). pierce plant stems or the ground so eggs can be laid. It is not used as a stinger. After these photos were taken, I placed it in my garden amongst the foliage so it remained camouflaged and hidden. Then once again yesterday, I spotted three ladybirds land on my front windows all at the same time. 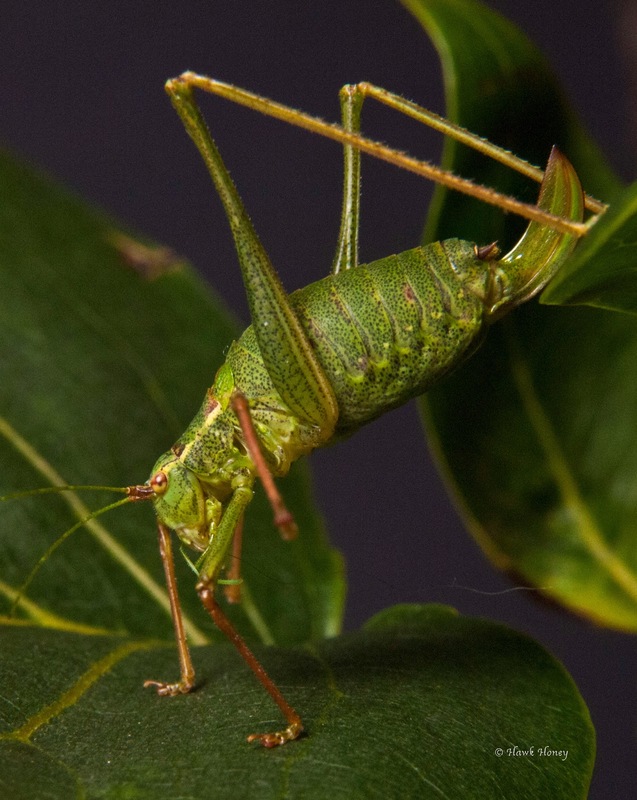 I went outside to ID them (Harlequins unfortunately) and as I came back in, what should be on my front door, yes, another Speckled Bush-cricket, but this time a male. I done no more and placed it straight out back in the same place I released the female. Lets hope they meet up and I get a nice population of bush crickets next year. Don't panic, I haven't bought myself a gun (perish the thought) and decided to go out killing things for fun. Believe me people do, just google 'Rebecca Francis' (Graphic image warning if you do) and you'll see the someone posing by lying down next to a giraffe she shot just for fun. I kid you not. Anyway, away from such negativity and onto my pursuits of positivity. It's autumn and around this time of year, deer begin the rut. A time when the testosterone levels in the males gets quite high and the need to mate reaches fever pitch. However, in deer, the females (doe's) are all protected by a single alpha male, who has earned that right by fighting off the previous alpha male and it is now the time that the alpha male has to fight off other contenders who want to mate with his females. The rut has begun. These battles can be quite spectacular with males charging towards each other to lock antlers with a sickening crash. The battles can be over in seconds, or can last several minutes with the defeated making a hasty retreat to fight another day, or, in worse case scenarios, retreating to find a nice place to lay down and die, so horrific the wounds can be from battle. 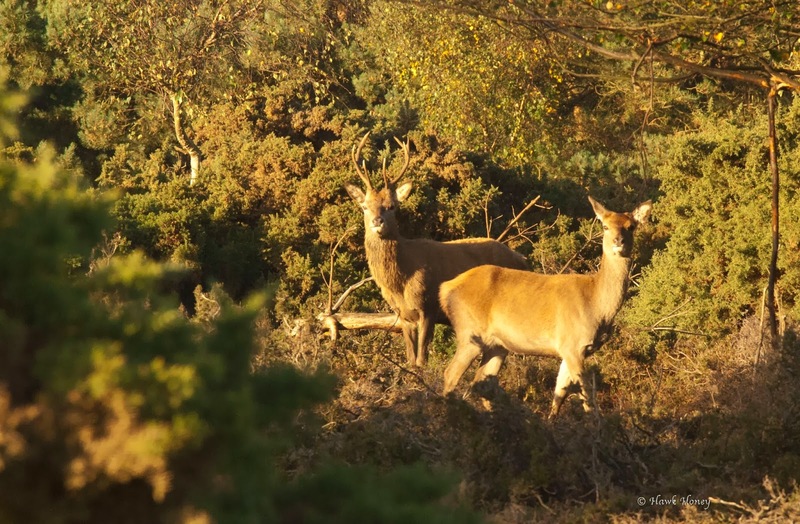 My intended place for going to see these dramatic battles was going to be Minsmere on the north east Suffolk coast, but on my way, I remember seeing the red deer (Cervus elaphus) next door at Dunwich during last years bat surveys that I helped with. So, I thought I'd pop into Dunwich first to see what was about and I'm glad I did. As I drove down the approach road, I spotted several doe's in the fields nearby and after finding somewhere safe to park, got out to have a look. As soon as I got out of the car I could hear the eerie sounds that I knew to be the stags barking. It's kind of like a drawn out bellow to warn off other contenders and attract doe's. A bit like drunks who come out of nightclubs/pubs with their shirts off, making guttural sounds. Trouble is, most humans who do that, really do not have the physique to match the action. So with the promising sounds emanating from the heather and gorse around me, the odds looked promising and with camera in hand I set off in the direction of the barks. Doe's grazing in the fields whilst out of sight, stags bark. Now it is important to remember that deer of any species (particularly the larger ones) are wild animals regardless how used to human presence they are. Even in the London parks such as Richmond Park, you can get quite close to the deer. 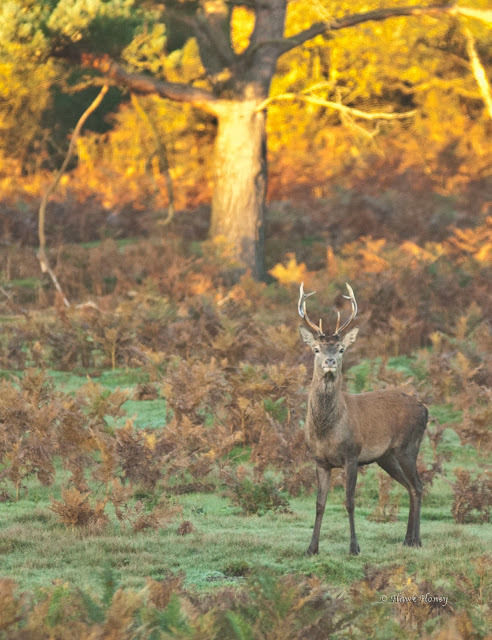 However, when the stags are in rut, they need to be given wide berths and you need to be aware of where you are in relation to them. Make sure you are never between a stag and doe's as you may be considered as a rival and before you know it, you could have a very beefed up testosterone fuelled male charging at you. Also make sure you never get between to stags either. If they decide they are going to rut, you being in the way will not put them off, you will not be an obstacle and you will either get trampled or tossed to the side with a swish of some very sharp antlers. Although I've often heard it said that several people have been killed by getting in the way of deer ruts, I cannot find any actual evidence of this happening. However, I didn't want to be the first statistic on the list, so was very careful and aware of my surroundings at all times. After much trekking in the direction of the barks, I eventually came across one male busy chasing a female across a field. As soon as my shutter clicked, he stopped and looked right at me. He was a good distance off, yet he held me in his stare and weighed up the decision of was I a threat or not. Not the best shot but I didn't want to get any closer. I must say, even though he was some way off, I still felt very nervous when he just stared at me not knowing what decision he was going to take. It was only for 30 seconds, but it felt a lot longer. Eventually, he realised I was not a bother and carried on chasing his doe's off into the wood. Barks were still coming from various directions and I trailed off to follow another stag's calls coming from one of those directions. It wasn't long before I came across another group of Red Deer grazing with an out of sight stag barking away close by. I stood behind a gorse bush and waited for a bit, mainly because to go forward would have been foolish as the path went in between a group of doe's on the left and the out of sight (but close) barking stag on the right. So I waited to see what would happen. The females could see me but were not afraid of my presence so made no alarm calls. After a little while, a doe came down a path on the right closely followed by a stag and from my position behind the gorse bush, I got my shot. Again, nothing much to right home about as I was not close enough. Again, the shutter clicked and they both looked directly at me. Again, I wasn't as close as I would like to be. They were the last ones I got photo's of and as I couldn't go forward I had no choice but to return to my car. Looking at the map on my phone, I could see I'd walked over 3 miles and was no longer on Dunwich Heath, but was on Westleton Heath next door. 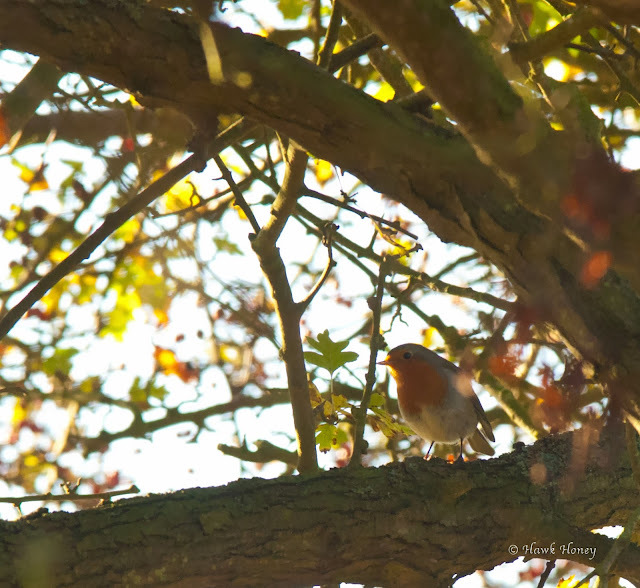 As I made my way back to the car, I heard a chirpy sweet tune from the hedgerow beside me and caught this little fella singing his heart out. A nice end to a nice morning. I didn't get the shots I came I enjoyed it all the same. Project B, because there is no project A. A few moments of your time please.